Ian Brown on the love-in between the big charities and transnational corporations. But do such partnerships offer the win-win solution claimed by the NGOs and their corporate funders, or are there losers? Does Erinch Sahan, an Oxfam private-sector adviser, have a point when he blogs: ‘I want to believe that pursuing profits will result in a sustainable world and the end of poverty’? One such partnership involves Save the Children and pharmaceuticals giant GlaxoSmithKline (GSK). Since 2011 Save the Children has benefited from GSK’s initiative to reinvest 20 per cent of the profits it makes in the world’s least developed countries (a fraction of its global $7.5 billion profit in 2013) back into projects which strengthen healthcare infrastructure and support the research and development of child-friendly medicines. Save the Children’s website claims a million children will be helped as a result of a ‘ground-breaking’ deal signed with GSK to improve children’s health in some of the poorest countries of Africa. No mention on Save the Children’s website, however, of one of GSK’s less child-friendly products – the antidepressant Paxil (Seroxat/paroxetine). We would never refrain from speaking out on an issue because we had a partnership with a particular company. That would clearly compromise our values,’ claims Save the Children. Seeing as it’s Christmas and all.. I can’t stop listening to this beautiful track by Icelandic artist Arnalds Olafur. The lyrics are beautiful too..
Serenades the water and carries me anew. Leaves the lasting sorrow and carries me anew. Last few posts before finishing up blogging..
“Joining forces with AllTrials is pretty on the eye yet deceiving. GSK, in this instance, are your street magician. They are showing the public the delights of magic and the public applaud. Ben Goldacre needs to start to listen to patients’ concerns and not the concerns of corrupt pharmaceutical companies like GlaxoSmithKline…. Isn’t Ben a doctor after all? and don’t they take an oath? 4 BBC panorama documentaries on Seroxat, a 3 billion dollar fine for GSK in the US, countless news stories, blogs, forums, petitions, GSK payouts in the US for Paxil (seroxat) etc and millions of hits on blogs and videos about Seroxat prove that what myself and Fid, and many others, have been banging on about (GSK’s Seroxat primarily) are far from conspiracies. Our opinions, and experiences, are based on facts and realities… they are thoroughly researched after over a decade of reading and educating ourselves… the truth of Seroxat is inescapable now, the truth is self evident. I wish Seroxat was a conspiracy theory, I wish it was fantasy..
but unfortunately for those prescribed it.. Witty of GSK he should ask him why the hell is this vile drug still on the market? Dr David Healy has a belter of a post over at his website. The post, entitled, “Persecution: He Who Would Do A Great Evil”, throws out much for debate and readers have been forthcoming with comments. Many of the comments mention the AllTrials Campain, spearheaded by Dr Ben Goldacre. He and I have never really seen eye to eye, he thinks I’m one of those “angry smeary conspiracy theorists”, (Fig 1) which is a shame. I’m really just a patient seeking answers from a big corporate company who lied about one of their prescription drugs that I took. Three days ago All Trials published a letter from Ben Goldacre on their website, the crux of which sees the announcement that Goldacre, along with Síle Lane (Director of Campaigns at Sense About Science) are going to be banging on the doors of individual pharma companies to ask them what they’re doing to fix the problem of future clinical trials reporting. At present pharmaceutical companies carry out clinical trials for their drugs and hand over the successful trial results to medicine regulators in efforts to get a licence to sell their wares to the public. Any failed trials (that shows the drug didn’t work or caused serious adverse events) are kept away from the regulators, doctors and the public. He probably (and this is just an assumption) was delighted when the UK’s biggest pharmaceutical company jumped on board the AllTrials train. His measure of elation overriding what lay beneath GSK’s reasons. It looks great for GSK, even more so for AllTrials – what a coup! One of the most abhorrent pharmaceutical companies in the history of medicine agreeing to open their doors to “the privileged” so “the privileged” can just see how GSK are trying, oh so desperately, to make it look as though they have nothing to hide. Do you think for one minute that GSK would have jumped on board any campaign spearheaded by any of their fiercest critics? Witty declined, even though Janice Simmons, who operates the Seroxat User Group, had amassed over 60,000 emails from Seroxat patients, most of them are struggling to get off Seroxat. AllTrials, however, have had red carpet rolled out for them by GSK because their campaign would actually make GSK look good. I mean whose idea was it to forget the 60,000 or so patients wanting help from GSK and, instead, focus on how to make GSK look like a great, caring company. Put the two together – what’s more important? GSK had nothing to gain by meeting Janice Simmons but they have everything to gain by teaming up with AllTrials. It’s all about image. Not the image of AllTrials. Not the image of Dr Ben Goldacre. The image of GSK. Dr David Healy has given evidence against GSK in US Courts. Would they have been so obliging to him had they had been approached by him regarding a campaign to open their doors to show their clinical trials? So, why have they teamed up with Ben Goldacre who has, in the past, been slightly critical of them? By turning against the patient, be they disgruntled or be they advocates pushing for answers, Ben Goldacre has created a divide. He, himself, is a physician and any patient with questions about prescription medication should not be turned away and be labelled in such a way to make them feel they are wrong. I think the concept of AllTrials is a good one. I think the terms under which pharmaceutical companies are agreeing to open their doors is a recipe for disaster. Goldacre, for what its worth, seems like a decent enough guy, I wouldn’t like him if he were my doctor though, especially if he could dismiss my concerns over a drug with a brush of the hand and a slur of conspiracy theorist. If the likes of GSK wish to be transparent then they should be so with absolutely no restrictions. Joining forces with AllTrials is pretty on the eye yet deceiving. Always bear in mind that magicians often use secret helpers to accomplish their magic. They also use sleight of hand to make things just disappear… Think Paxil 329. Considering that I’m finishing my (8th year) blogging adventure soon, I decided that I would not mince my words with my last few blog posts about Seroxat and GlaxoSmithKilne. There is no other way to describe the CEO of one of the most corrupt and devious pharmaceutical companies on the planet, and calling him that is really very tame. Dr. David Healy didn’t say that in his latest blog post, but it’s pretty much what came to mind when I read it… so why should we mince our words when it comes to these sociopaths? They don’t give a crap about people damaged by the drugs they sell, we mean nothing to them, dead babies from Paxil mean nothing, dead teenagers from suicide from Seroxat or Wellbutrin mean nothing, or patient heart attacks from Avandia, our lives mean zilch. We are disposable consumers, road kill, collateral damage. This is the Fifteenth in the Persecution Series, after The Persecution of Heretics, The Persecution of Vulnerable Adults, Harassment from the BBC to GMC, Harassment from Rolf Harris to James Coyne to Doctor Who, Persecution: Black Riders in the Shire & Persecution: Rumbles from Mordor, of which there were eight in the SUI Cide Series SUI Cide in Betsi, SUI Cide Trick or Treat , The SUI Cide Note & SUI Cide or Homicide,SUI Cide in the OK Corral. SUI Cide & Peace in our Time, The SUI Cide Apparatus, Professional SUI Cide. This marks a new Pharma sub-series. The $3 Billion fine stemmed in the first instance from Study 329 for which New York State sued GSK for fraud. This is the study that colleagues and I are rewriting at the moment – at what risk? Pharma has taken a regulator to Court twice. The second was in 2013 when AbbVie took the European Medicines’ Agency (EMA) to the European Court to protect Humira in 2013. The first case happened in 1969, when Upjohn took FDA to Court over Panalba. The 1962 amendments to the Food and Drugs Act required companies to show their drug was effective using controlled trials. For all drugs licensed prior to 1962, FDA insisted on a retrospective Drug Evaluation Study Initiative (DESI) to look at these. DESI convened panels of medical academics to adjudicate on each of the older drugs. At the time there were many combination products – combinations of two antibiotics or an antidepressant and a tranquilizer. FDA and most academic physicians did not approve of combination products, whether antibiotics, analgesics or psychotropics. DESI recommended removing most of them from the market. In 1969, DESI lined up Upjohn’s Panalba for the chip. Panalba was a combination of tetracycline and novobiocin. By FDA’s calculations Panalba was likely responsible for 12-15 deaths per year that would not have happened if doctors had used tetracycline alone. At the time Panalba was making $18 million per year for Upjohn – 12% of their income; $1 million per death. There was evidence that Upjohn knew of the risks the drug posed and in house evidence that Panalba was no more effective than tetracycline alone. The company chose option 5. Liaising with the Secretary of State for Health in the new Nixon Administration that had just taken power, Upjohn pursued a legal action all the way to the Supreme Court. When the details of the case were presented some years later to business management students in the University of Pennsylvania, Scott Armstrong found that none of his class supported Upjohn and all bar two of the 71 found Upjohn’s behavior irresponsible. But when he got students to role play the Upjohn Board and faced them with the decision to pull the drug or not, he found to his astonishment that 79% of respondents opted to take the same course of action as Upjohn and none withdrew the drug. This result has been widely replicated in different national groups with socialist Swedes behaving the same as capitalist Americans, and the idealistic young in just the same way as their cynical elders. Debriefing the subjects and attempting to adjust the board and the circumstance to see if behavior could be modified, Armstrong and others were left with the conclusion that it is generally accepted that the primary duty of Board members is to stockholders rather than to society at large. Board behavior can be modified by appointing stakeholders but even then few Boards opt to remove Panalba from the market. Armstrong modified the role play experiments by introducing an Upjohn safety officer who told the Board that the company did have hidden evidence supporting the complaints – to no effect. In real life not even the death of the CEO’s wife from suicide, from the Company’s drug Prozac, has led to a decision to pull the drug or add warnings. Putting people in a group where the unstated assumption is they will behave like a proper Board produces a situation which has commentators reaching for comparisons with the Milgram experiment where decent ordinary people in experimental settings can be induced to give life-threatening shocks to innocent strangers simply because they are asked to do so by the conductor of the experiment. What’s true of a pharmaceutical company Board is probably no less true of a Hospital or other Board especially when these boards see themselves as being in the business of defending brand value. The only thing that appears to modify the likely behavior of a Board is a threat of boycott – that is if maintaining the drug on the market led to the kind of disenchantment that caused the company share price to fall, the Board would respond. While in real life this is close to what happened when GSK threatened not to supply anti-retrovirals to South Africa, Fear not, Andrew shall never vanquished be until Great Birnam Wood to high Dunsinane Hill shall come against him. Doctors don’t do Boycotts. Why should they? They don’t suffer the consequences of pills going wrong. We have to accept Andrew Witty’s suggestion that he and other employees of GSK are just like us, even if few of us can imagine being party to behaviors that warrant a $3 Billion fine. But Armstrong’s study suggests we are more like him than Andrew is like what we might like to think of ourselves. The problem is if everyone is so good, whence the growing Fascism in healthcare? We can retreat to the wilder shores of conspiracy theory and claim the problems are down to the Germans, the Jews, or a Socialist cabal. Or we (including Andrew) can attribute the problems to a few people somewhere in a pharmaceutical company who break laws. 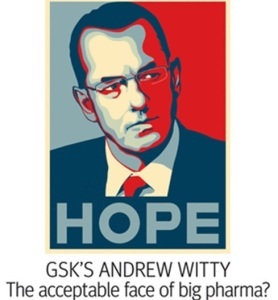 If we accept that the Board of GSK and other companies are populated with people just like you and me, who are perhaps even less likely to break the law than you or I, the $3 Billion fine for GSK notwithstanding, then the more sensible option is that the problem must stem from the system – which is just the opposite to what Andrew is saying. We can change systems from the top-down or the bottom up. RxISK is about bottom-up change. If GSK loses with a Boycott, so do we. We lose access to useful treatments. This led RxISK to propose an alternative to a Boycott – an AbbVie. Rather than not speak to GSK or other companies, to AbbVie means to speak as much as possible to a company telling them and the world more about their drug – feeding back the range of effects the drug has, some good, many bad. This is a way to make drugs better – a good medicine is a chemical plus good information. He who would do a Great Evil.. They likely feel little connection with the increasing numbers of people who die a premature death because of pharmaceuticals – and why should they given that no-one in GSK ever prescribes a drug? In a just published article in the BMJ, Peter Doshi notes how in recent months the English pharmaceutical company GlaxoSmithKline (GSK) have assiduously portrayed themselves as advocates of transparency and in support of access to clinical trial data. Well in support of ‘Responsible Access’. Responsible essentially means that a researcher commits to the primacy of RCTs and statistical significance over an analysis of adverse events. It would not for example be responsible to claim that an SSRI causes suicide, a statin muscle damage or cognitive failure, or hypoglycemics cause hypoglycemia unless a trial has shown this to happen to a Statistically Significant extent – and they never do. This scenario suggests a variation on the old joke that Cricket is the English idea of fair-play – eleven against one. Efforts to get at the raw data are just not Cricket. A failure to be converted to a Responsible way of looking at the data underpins the stand-off between GSK and the RIAT team attempting to restore Study 329 to what it should have been. Study 329 is GSK’s most famous clinical trial. RIAT stands for Restoring Invisible and Abandoned Trials (see Reading the RIAT Act). The Doshi article along with the correspondence between GSK and the RIATers makes for eye-opening reading. To recap, in 1998, SmithKline Beecham reviewed the final data from Study 329, a study begun in 1994, comparing Paxil, imipramine and placebo. They concluded that it demonstrated that paroxetine (Paxil-Seroxat) did not work for children. They decided they couldn’t show the data to FDA but they could go ahead and publish the “good bits” of the study. This ultimately led to a publication in 2001 in the leading journal in the field of child psychiatry, the Journal of the American Association of Child and Adolescent Psychiatrists, with an authorship line to die for. The first author was Marty Keller of Brown University. There were over twenty others. The article states clearly that Paxil is safe and effective in children. Most doctors eyeballing it, and its distinguished authors and the journal in which it was published, would be much more inclined to use Paxil afterwards. That so many doctors in New York State in fact went on to prescribe so much Paxil to children led New York State to take a fraud action against GSK in 2004. This study was later at the center of the US Department of Justice’s case against GSK that resulted in a $3 Billion fine. None of the apparent authors, it transpired, were authors in the sense people in the street would be likely to understand authorship. The real author – Sally Laden – appeared nowhere on the authorship line. The story behind the publication of 329 is laid out on Healthy Skepticism along with the efforts by Leemon McHenry and Jon Jureidini to get the “authors”, or the cuckolded institutions who lent their prestige to this ghostwritten article, or JAACAP, the journal in which it was published, to retract. Which all refuse to do. And GSK as of a few weeks ago state that “GSK does not believe the article is false, fraudulent or misleading” (see GSK to RIATers). This is astonishing but there is another equally astonishing story to tell. The temptation is for non-academics reading this to glaze over at the sight of theologians arguing about how many angels can dance on the head of a pin. But in fact those of you who have nothing to do with healthcare – the Irresponsibles – as it turns out were then and always are better placed to know when there is a problem. It was the doctors, ethicists and theologians, the Responsible Adults, who missed it. And if this is true of 329, it is likely to be true of everything else as well. Study 329 began to unravel because a journalist, Shelley Jofre, working for BBC’s Panorama, accidentally left to her own devices, begin to dig. She went to the American Psychiatric Association Meeting in Philadelphia in May 2002, clutching the Keller-Laden paper. She was interested to interview some of the “authors”. One of her questions was “What is emotional lability?” There was a surprising number of children in 329 who became emotionally labile – what’s this? she asked. No-one seemed to know. At APA, she approached one of the 329 authors Neal Ryan, who gave a non-answer and quickly got in touch with GSK to let them know a journalist was asking questions. A few weeks later in July and again in August, GSK send a dossier to FDA seeking approval for Paxil for children. A few weeks after that, on October 7th, to coincide with World Mental Health day (October 10th), Newsweek hit the streets featuring a depressed teenager on the front cover and a strapline Teen Depression: 3 million kids suffer from it. What you can do. The message inside was that Prozac was already being marketing for children and Paxil and Zoloft were about to be. What you can do – is get children on Prozac, Paxil and Zoloft. I’m planning on finishing up blogging by the end of this year (as I mentioned in a previous post). However, I plan to leave my blog online as I feel it is a very important resource for psychiatric drug casualties (particularly for those who took Seroxat/Paxil). It also documents GSK’s criminal history- and contains numerous other issues relating to the Seroxat scandal etc- therefore it will be left open for anyone to read. I understand that the admin moderator, Scotty (Laurie Yorke), seems to have just had enough of moderating the site (running sites like that can be thankless, tiring and stressful), and it was a site which was certainly no stranger to drama and controversy, but what I don’t understand is: why was the site shut down completely? Why was is shut down so quickly? (within a day it seems) and also what will happen to the information contained in the site? Surely there were also other people (moderators, long term members etc) who would have been willing to continue administrating the site- to keep it going? One of the great myths of what often gets called “mental illness” is that people who have been diagnosed “lack insight”. The truth is that too many doctors lack the insight to ask – or the time to listen to insights that differ or dissent from the masses of data they have crammed into their busy brains and busy schedules. Another great myth is that all psychiatrists must be evil – when in fact very few are. Some are even making the time to listen and to help make space in busy training schedules for trainee psychiatrists so that they too can learn to learn not just from text books but from their patients. Back in 2001 – 2006, we started hearing about how outsourcing some research would so great. We started looking at the growth and predicted that by 2015 there would be 10-20% of all pharma R & D done in China and India. I think it went much faster, and produced little so far, although I do expect that eventually China will start doing much of it, as they have enough resources to make it happen now. Many of the outsourced compounds, libraries, and much of the development work has been of poor quality, slower than before, and much of the work is questionable validity. Oh well. But here in the US, we won’t have the money to buy the latest medicines from China, since no one will have a job any more, at least in many areas. But at least the former CEOs of the pharm and biotech industry will still have their yachts. I just hope that the industry recovered at some point and can bring back some jobs once we realize the poor quality of what we get from outsourcing to the lowest bidder. Sorry to dwell on this, but my remaining friends still at GSK are now waiting in suspense, just in time for the holidays. What a great Christmas gift. Many in GSK R&D at the time thought these comments were overblown, hyperbola, bravo, that could never come to pass. Drug discovery & development never has, and never will be analogous to electronic chips, packaging into computers or tablets or cell phones, high volume marketing with free will purchasing (eg not regulated or filtered by doctors or insurance or providers). And then there were all the very costly missteps, some not directly from GSK, that already forced cuts to R&D: Avandia critic Steve Nissen, Sirtis, HGS, darapladib, China GSK, many reorganizations, invisible upper management, lack of accountability for the poor decisions (promotions instead)…..
It’s tragic that such good company(ies) could be so badly managed and so quickly decimated. GSK is the second-largest drug company in the world, with a 7 per cent market share behind America’s Pfizer at 11 per cent. Last week Mr Garnier’s contract was extended by seven months to May 2008 so he could steer the group through a crucial year that will see the launch of several key medicines. They include Cervarix, a vaccine for cervical cancer, Tykerb, an oral treatment for breast cancer, and Eltrombopag, a blood clotting agent in the treatment of breast cancer. These blockbuster drugs are set to bring in billions of dollars of extra revenue, enabling the company to pour large chunks into drug discovery from 2008, Mr Garnier said. This year the group is spending $4.4bn on developing new medicines, around 16 per cent of overall revenues, but the goal is to get that figure to the 20-25 per cent range over the next 10 years. So how’d that work out? Tykerb has had a rough time of it in some clinical trials, and its revenues last year were about $340 million and falling. Ceravix brought in $270 million, down 37 per cent (although that drop was mostly due to trouble in the Japanese market). And eltrombopag, known as Promacta, was a brighter spot, with $307 million in revenues, up 46%. But you’ll note that all three of these put together did not bring in a billion dollars of revenue in 2013, which would surely not have made anyone happy if you’d told them that in 2006. And the R&D spend last year was 15% of overall revenues – less than the starting point in the above article, and nowhere in sight of that 20 to 25%. And with the company set to cut even more tomorrow, I think we can rule that out for the near future, too. Illness and what creates illness with Gabor Maté. If you’ve been reading Beyond Meds for any length of time you’ll know that Gabor is one of my favorite human beings. He is an inspired brilliant man who is helping us change the healing climate on this planet.